THE Cause Circle from Dare2Share is a simple tool that will help you be purposeful about sharing Jesus’ message with your friends. to persuade them to consider Jesus’ message. 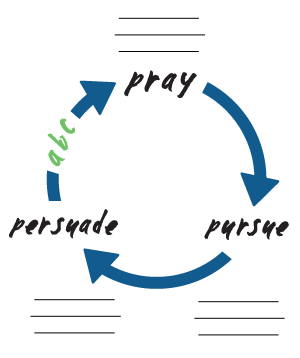 I like the visual and short summary of this relational approach to evangelism. It begins with prayer for your friends. Then you look for and pursue spiritual conversations when you observe spiritual thirst. Finally, over the time, you share the gospel with them and seek to persuade them to consider his message. The Evangelism Linebacker explains the Cause Circle below. This is the point in time when someone believes the gospel message and trusts in Jesus as their only hope of salvation. The Bible says in Hebrews 10:25 that we shouldn’t forsake the assembling of ourselves together. It is vitally important to help newly converted teenagers connect to other Christians so that they can learn how to follow Jesus and grow strong roots in their newfound faith. Teens who come to Christ and connect to a church should also be challenged to commit to THE Cause of making disciples who make disciples. They must be motivated and equipped to live and give the gospel in word and deed and multiply. Print THE Cause Circle for your own use. Thanks for Dare2Share for making this evangelism training tool available. Are Evangelism Surveys Valid Conversational Tools?